Serigrafía For the first time in Spain, this internationally recognized artist, Member of Japan Artist Association, Professor Emeritus of Nara Saho College of Japan, Guest Professor of China’s Inner Mongolia University, will be presenting his work with red03 Art Gallery in Barcelona, from 20 to 30/09/2012. The inauguration will take place on 20.09.2012, at 20h in the presence of the artist, at San Pere Mes Alt 74, 08003 Barcelona Tel. +34 605 829 931 – www.red03.com “Art is a way of communicating the mind of artists to the viewer. My intent as an artist is to make silkscreens which convey a sense of humor. I hope you enjoy my exhibition.” 1936 Born and works in Osaka, Japan Graduated from Osaka Fine art school and Kansai University Held Personal Exhibitions 129times in the past, Japan, USA, Canada, S.Korea, China, Austria and Hungary 1988 International Biennal of Graphic arts, Cracow, Poland 1989 Bharat Bhavan International Biennial, India 1989 Lodz International Miniature Print Biennal, Poland 1990 International Exhibition “Art of Today”, Budapest, Hungary 1991 International Print Biennial Varna, Bulgaria 1994 Osaka Treinnale 1994(print), Osaka, Japan 2000 Cheju International Prints art Festival, Korea 2000 Qingdao International Print Exhibition, China 2001 Bridge-Exhibition of Chinese & Japanese Prints, China Public Collections Machida City Museum of Graphic Arts, Tokyo, Japan. Toyonaka City, Board of Education, Osaka, Japan. Hirakata City Office, Osaka, Japan. Pusan-City North-Ward Cultural Center, South Korea. 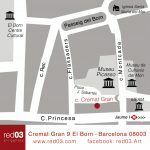 Per primera vegada a Espanya, aquest artista reconegut internacionalment, Membre de Japan Artist Association, Professor Emeritus of Nara-Saho College de Japó, Guest Professor de la Inner Mongòlia University de la Xina, estarà presentant el seu treball amb la red03 Art Gallery de Barcelona, des del 20 fins al 2012.09.30.